Will Graham will preach in Johnson City, Tennessee, this weekend, April 27-29. Watch Live This Weekend: Will Graham preaches in Johnson City, TN, this weekend with music by Aaron Shust, Crowder, Ellie Holcomb and more. It begins at 6:30 ET Friday and Saturday, and at 3:30 ET on Sunday. Since Feb. 21, millions of people around the world have mourned the loss and celebrated the life of Billy Graham. His grandson, Will Graham, has been right there with them. “I knew my granddad was well loved,” he said, but added that he’d lost perspective on just how many people outside of the United States have been impacted by his grandfather’s life. He called the outpouring of support for his family “humbling” and said it’s been amazing to see so many gain faith in Christ as a result of his grandfather’s passing. “The Lord was honoring Himself through all of this,” he said, reflecting on the past two weeks. Will has also been looking ahead to the coming months. On April 27-29, Johnson City, Tennessee, will host Will’s first Celebration since his grandfather’s death. He’ll preach at similar events in Australia this May, followed by Scotland in June. Will Graham loves cold weather, and he’s looking forward to coming to Canada this fall. He will be preaching at two Celebrations of Hope, one in Rankin Inlet, Nunavut on Oct. 26-27 and one in St. John’s, Newfoundland on Nov. 2-4. Learn more about the upcoming Celebrations with Will Graham in Canada. Franklin Graham plans to share the Gospel in Monterrey, Mexico, the capital of the northeast state of Nuevo León. Pray for many people in this bustling city to respond to the invitation to accept Christ as their Savior. That’s the hope he will continue communicating no matter where he is in the world—the hope of eternal life, the hope found through the Gospel of Jesus Christ. “The Gospel transcends culture, transcends language, transcends politics,” he said. Whether he’s crossing the mountains into Tennessee, traveling to his Scottish ancestors’ homeland or flying across the world to southwest Australia, the same spiritual need exists. “They’re still looking for the same things in life,” he said. The cultural landscape may not be the same as in his grandfather’s day, but then again, Billy Graham did preach for over 60 years. The Bible is powerful, he continued, filled with living words that change people’s lives. In past months, Will has been in the process of sharing the Gospel a different way—on the movie screen. He heads to California in a couple of weeks to continue work on Unbroken: Path to Redemption, a sequel to the Hollywood film Unbroken about the real-life story of Olympian and prisoner of war Louis Zamperini. After struggling with post-World War II trauma, Zamperini surrendered his life to Christ at Billy Graham’s 1949 Crusade in Los Angeles. Will is portraying his grandfather in the movie, which will be released later this year. He admits going back to the movie set will be hard following his grandfather’s death. As Will strives to take his boldness up a notch, he’s also mindful that the Good News is urgent news. 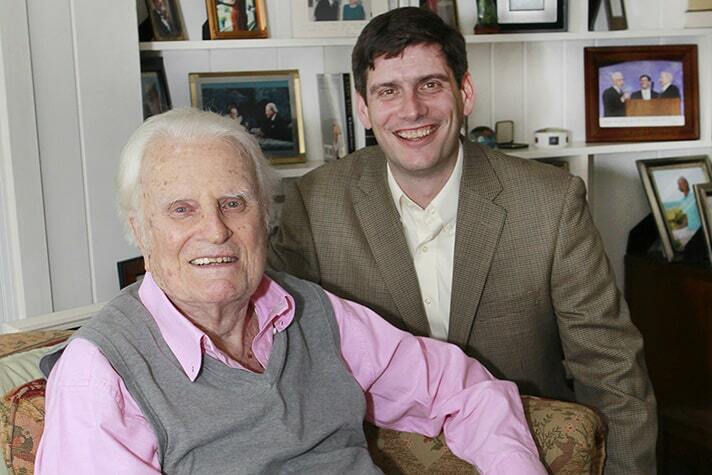 Like his grandfather and father, Will Graham knows that prayer must precede his preaching. 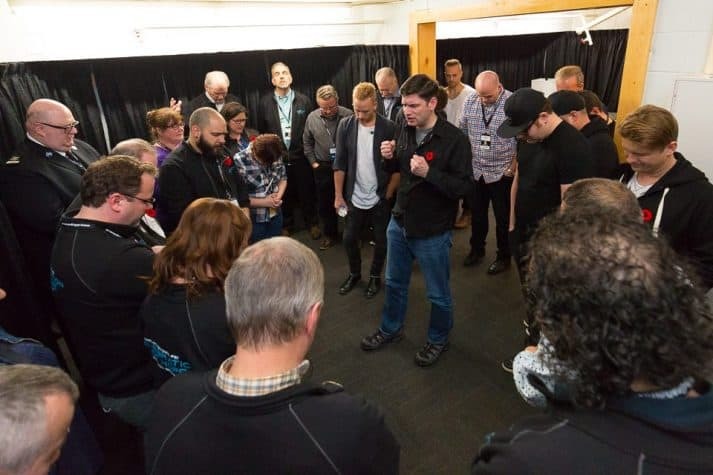 Here, he joins staff and crew members in talking to God during a Celebration in Charlottetown, Prince Edward Island, last November. While the founder of the Billy Graham Evangelistic Association (BGEA) has now passed on, the ministry itself isn’t slowing down, Will said. Where does he see BGEA 10 or 20 years from now? “I’m going to see BGEA hopefully on the forefront of leading people to Christ through Crusades, internet evangelism … the Rapid Response Team,” he said, naming just a few of the organization’s key ministries.